The world's largest collectible fair for antique dolls, teddy bears, “Hummel" figures, miniatures, Christmas decorations, tin toys and elastolin figures in the Bavarian doll town Neustadt near Coburg. Large international antique doll Collector´s Fair in the Frankenhalle! 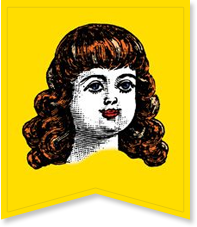 Look forward to thelargest Collector´s Fair inGermany for antique French and German porcelain head and celluloid dolls from different manufacturers: Käthe-Kruse, Schildkröt, Heubach Köppelsdorf, Waltershäuser Puppenmanufaktur, Sigikid, Götz, Goebel etc.You will also find antique miniatures and dollhouses, miniatures 1:12, machanical dolls, doll heads and bodies, Christmas decorations, Barbie dolls, artist and collectable teddy bears, fabrics, lace, wigs, accessories, Steiff animals, tin toys and old toy. Experts and collectors from Germany, the Netherlands, Belgium, France, from the Czech Republic, Poland, Russia and Spain await you at the Collector´s Fair. No question, real lovers of antique dolls will get everything their heart desires at the sales fair in Neustadt near Coburg. Because at the Collector´s Fair a variety of antique Käthe Kruse rarities are waiting, which can be admired extensively. In addition to Käthe-Kruse dolls there are also of course Schildkröt dolls - and the Heubach Köppelsdorf dolls are not missing either. "It's great that we are presenting antique craftmanship “Made in Germany” with these dolls", says the organizer Christine Spies. Anyone who is interested in old porcelain head dolls, should not miss the Collector´s Fair. The antique porcelain head dolls are hand painted and partially decorated with real hair. Do you own an antique doll or another toy rarity? Then bring it to the estimation point at the Collector´s Fair and let them estimate value and age. You also have the opportunity to sell, trade and buy. Dolls that already small have blemishes, can be cured at the booth of the doll and bear doctor immediately. Of course, there are also beautiful accessories at the Collector´s Fair in the Frankenhalle: From the large dollhouse down to the tiny bath rug visitors will find everything the heart desires. In addition, antique dresses, fabrics, lace, shoes, wigs and much more can be found. Finally, the antique dolls should continue in shine. 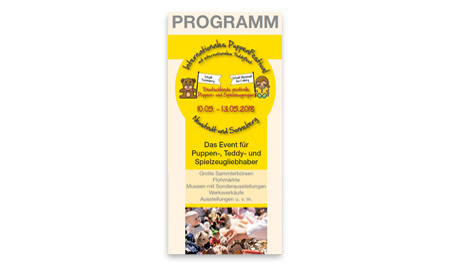 Incidentally, the next antique doll Collector´s Fair in the Frankenhalle will take place on the 31th Mayand 12th of June 2019 as part of the PuppenFestival in Neustadt near Coburg and Sonneberg. So be sure to mark that date now! 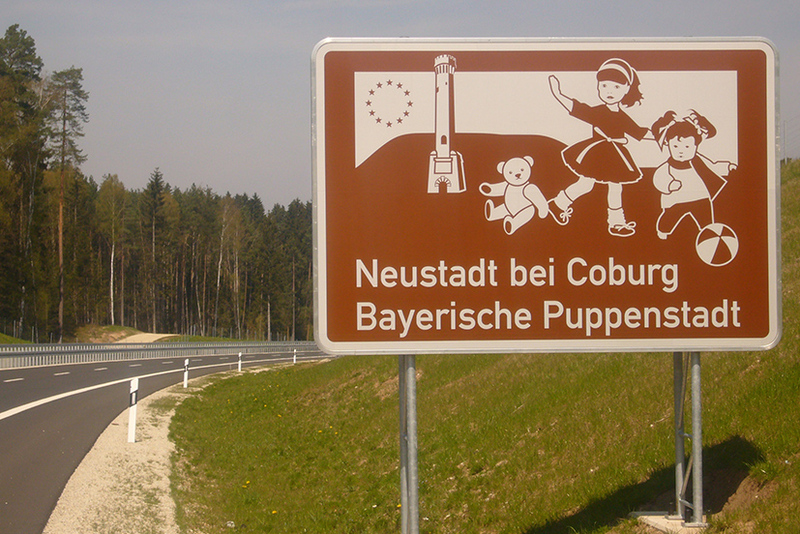 From 26th May and 12th of June 2019, the International Doll Festival will take place in the Bavarian Doll makers Town of Neustadt near Coburg with the large antique collector's fair, the MOA competition and the big flea market! Lovers of teddy bears, antique and collector dolls, metal tin toys, miniatures, railways, Christmas decorations and elastolin figures come to their full satisfaction. During the festival week, museums with special exhibitions, manufacturers and factories with factory sales as well as the large antique and collector's flea market attracts with rarities and bargains. Visitors from all over the world are looking forward to this big event in Germany. Find out more about the events you would like to participate in as an exhibitor or visitor. Here you can download logos and forms for the Neustadter PuppenFestival 2018. Registration for exhibitors at the Great Collector's Fair in the Frankenhalle. Download the program booklet for the Neustadter PuppenFestival here. Download the logos for the Neustadter PuppenFestival for further use.